We use a range of boxing solutions for our books, and the type of box chosen depends on the condition of the collection, the quantity of books that require rehousing and the budget available. Below are some examples of the book boxes we use to house our collections. Good housing is essential to prolonging the useable life of our collections. 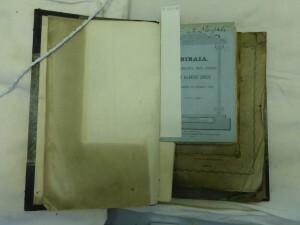 It protects the item from accidental damage whilst in storage and prevents scraping of the book covers as they are being taken off and replaced on the shelf. Boxing also protects collection material from incidental light damage. Extensive exposure to light causes media to fade and paper to bleach or darken. By storing collection items in boxes, it reduces the amount of light falling on the objects which occurs when the lights in the store room are turned on to access other items. Since light damage is irreversible and cumulative, this is vitally important. Potentially damaging dust can also be prevented from accumulating on the item through boxing. You can read more on the dangers of dust here. Good housing also provides a barrier to changes in the environment. Fluctuating temperature and relative humidity cause collection items to expand and contract, which results in micro stresses within the item, which will eventually weaken it. Although the environment in our store rooms is controlled and constantly monitored to ensure the conditions don’t exceed the ideal parameters, boxes provide an added layer of protection and keep conditions immediately surrounding the item even more stable. Finally, in an emergency situation, such as a flood or fire, boxes protect the collection items by absorbing excess water and protecting them from smoke damage. As you can see, this simple conservation step has multiple benefits, and by boxing clever, we can ensure our collections will be fighting fit for years to come. This entry was posted in Projects and tagged book boxes, laing, Preventative Conservation, rehousing by conservation. Bookmark the permalink. Thanks for your comment. You can buy standard size boxes that may be suitable for your needs from Conservation by Design and Preservation Equipment Ltd. There is a huge array of boxes available, but if you speak to the sales staff, they should be able to help you find the right product. When choosing storage boxes, it’s best to go for those made from acid-free materials, and preferably with an alkaline buffer. Hope this helps! Thank you very much for your very quick reply. I will do as you suggest and speak with the two companies. I do not need many and so it should be affordable. I want to make sure my books are well looked after as they give so much pleasure. No problem, Roy. Good storage will definitely improve the lifetime of your books. Prevention is better than cure! Indeed! Some of my books are in a press cupboard against an outside wall, and I sometimes worry about cold and damp there. But my space is limited. It’s not ideal to store books in a damp environment, but it is very difficult to get perfect environmental conditions at home! Perhaps you could get a thermo-hygrometer such as this to find out what the temperature and relative humidity is in your cupboard. Ideally paper-based materials should be kept at around 50% relative humidity and 18 degree Celsius. No problem, Ray! Best of luck with your collection.